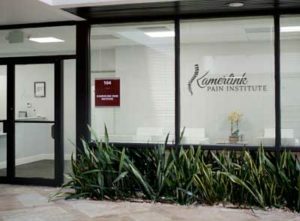 The friendly staff at Kamerlink Pain Institute welcomes your call and looks forward to serving you. If you have any questions about our pain management services, please call our office at (561) 404-7667. In the event of a life-threatening medical emergency, call emergency medical services at 911 immediately. DO NOT WAIT! Inform the emergency room staff that you are a patient of Kamerlink Pain Institue , and they will contact us. If you have an urgent medical need and need to talk to Dr. Kamerlink after our regular hours, please call our office at (561) 404-7667. A doctor is on-call 24 hours a day. Your call will be returned promptly. At Kamerlink Pain Institute, we accept workers’ compensation, Medicare, and most major insurance plans. Please contact your insurance company or you may call our office at (561) 404-7667 to find out if we accept your plan. If your insurance plan requires you to pay a co-payment, co-insurance, and/or a deductible, you will need to pay at the time of your visit. For your convenience we accept cash, Visa, MasterCard, Discover, and American Express. If you have a question related to your bill or insurance, please contact our billing specialists at (561) 404-7667. Learn about pain management in our interactive patient education library.